Inside one of the art cart’s drawers are the alphabet beads. 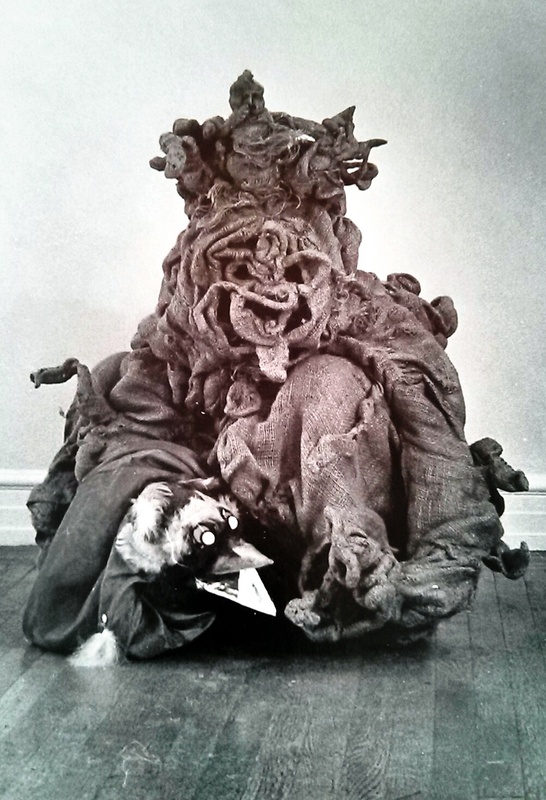 The children use them in many different ways, connecting them by elastic string or pipe cleaner if they want to take them home. 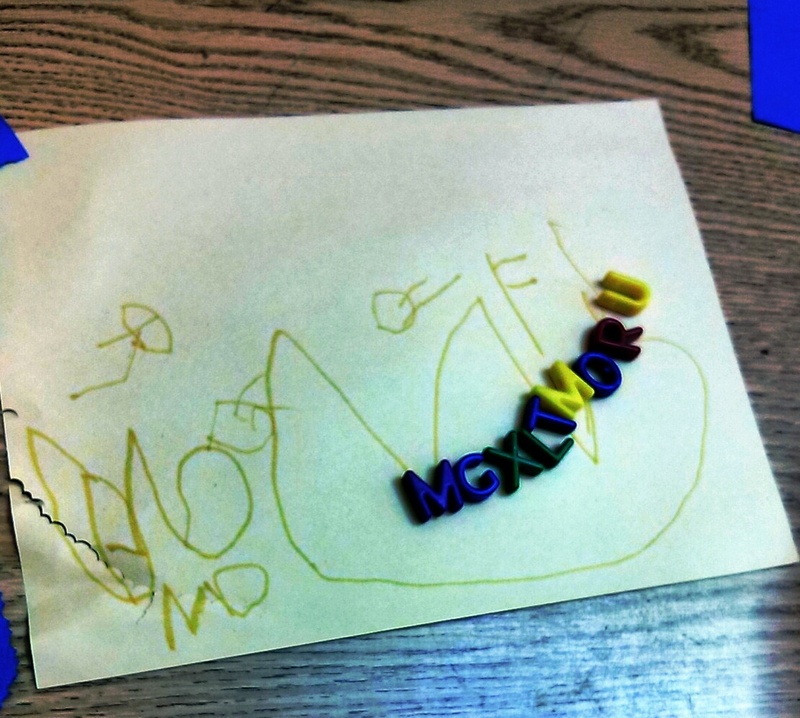 I observed one three year old begin by writing an M on a piece of Manila paper. Matching an M from the letter drawer, he shouted enthusiastically, “M for me!” Indeed it was, as M is the first letter of his name: Matthew. He began using other letters, sounding them out and laughing. “This is a wacky game,” he stated as he realized the letters formed funny sounds. I was amazed at his ability to sound out the random letters. I asked if he did this at home. He nodded. He then noticed and asked about the letters on our art cart of loose parts. 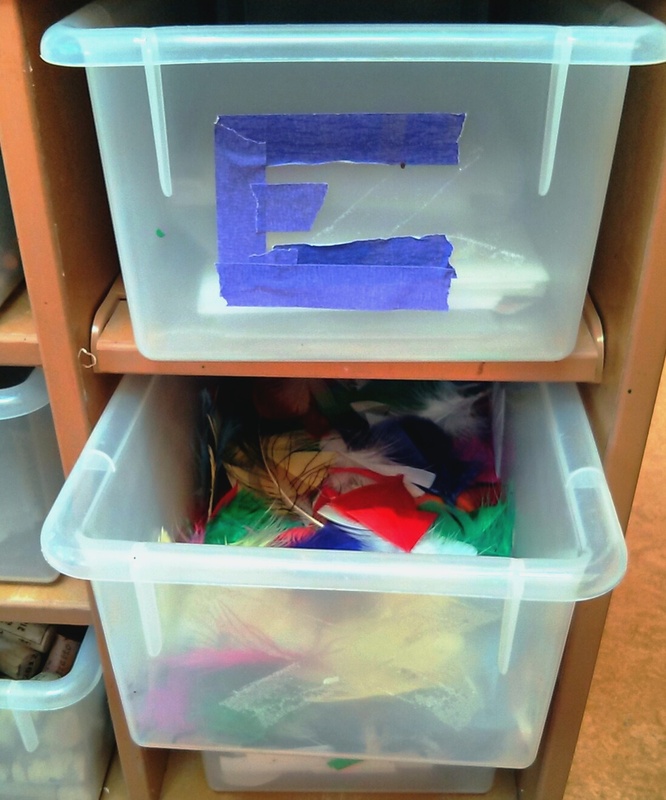 (Loose Parts: See blog of May 3, 2013: Open Ended Creativity) Children from previous years, also interested in letters, had used colored tape to make the first letter of what was contained inside the drawers. As the materials often change, at times the letters do not match. “That’s an X,” said the boy, clearly puzzled, as he looked inside at the envelopes. “Do you want to help me change the letter,” I asked. He did and directed the making of an E.
“You did it,” he cheered as the E became recognizable. 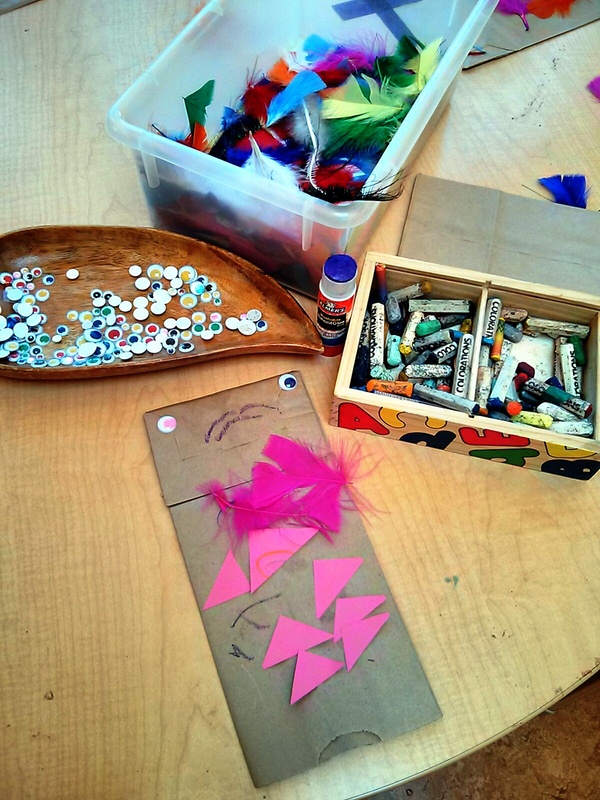 I like to have letters, in many forms, included in our art cart of loose parts. Those who are interested will choose them, others will choose additional materials. As I see the children each year they attend preschool, I’m privileged to watch their interests grow and change. 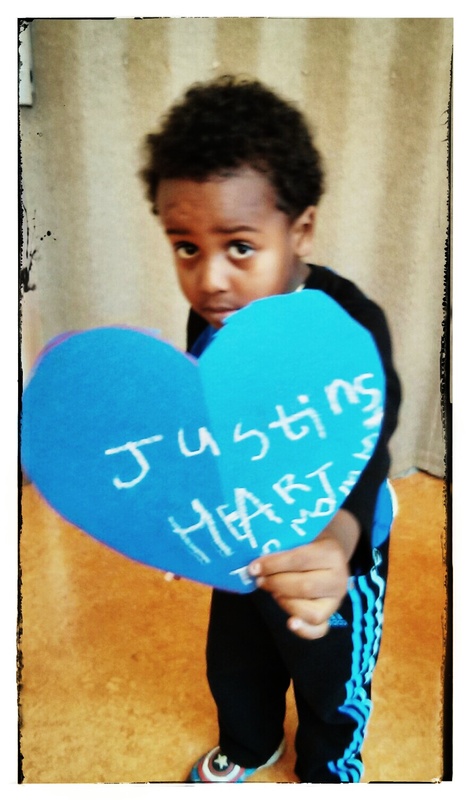 One child who made letters using colored tape when he was three, (Photo in blog of May 3, 2013) now, at four, is able to sound out and write the words “Justin’s heart for mommy” on a large sheet of construction paper. The heart activity emerged when I was asked by another child to draw them a heart. Instead, I showed her how to create one of her own by folding a paper in half and drawing and cutting on a curved line. Those interested mastered cutting along the drawn line and unfolding the paper to discover the heart. “Draw LOVE on your heart, “ Justin said. 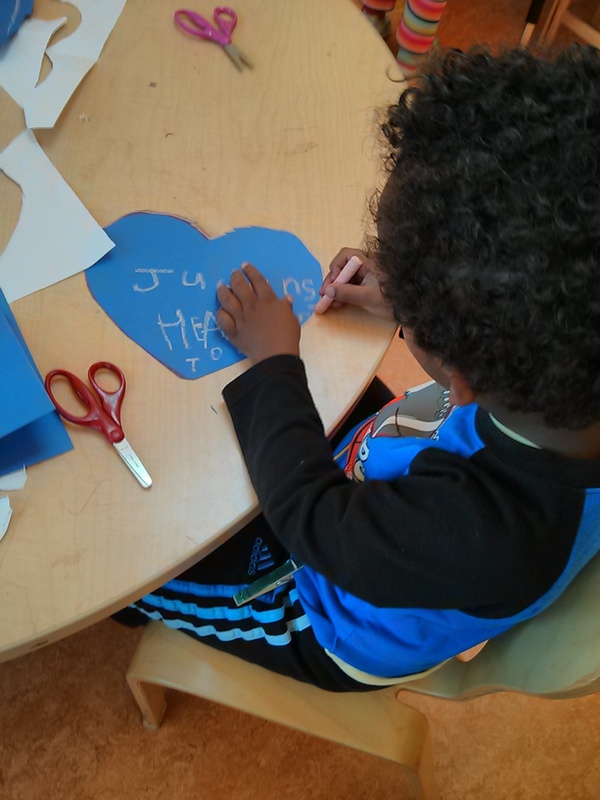 When the other child wasn’t interested in writing, he decided to make a heart of his own. When left to pursue what engages them, the children have a diverse range of interests. While these two children were very interested in letters, others are not. Those who develop their interest early become the teachers when their peers are ready. On the preschool level, readiness is the key to mastering new skills. Being able to make choices according to individual interest paves the way for a lifetime of learning. 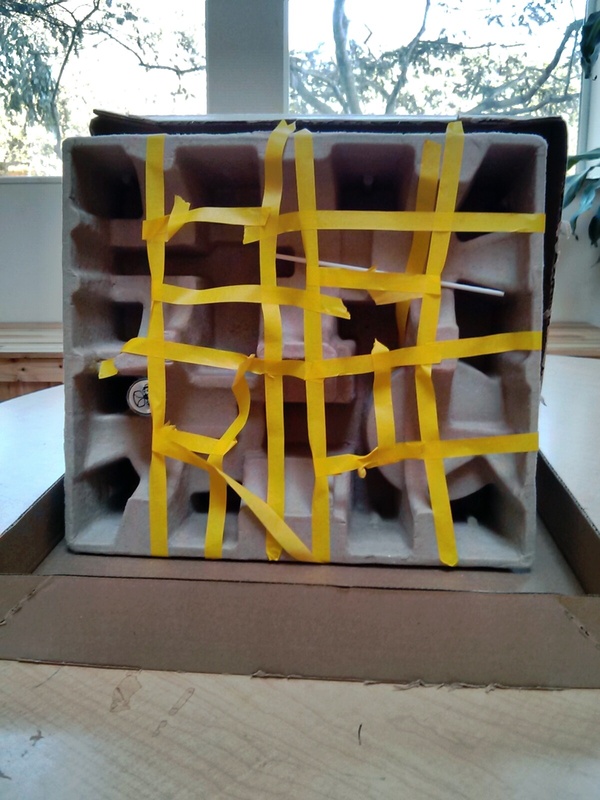 In blog of April 8, 2013, I wrote of setting up open ended materials and tools for working with colored masking tape, elastic cord, glue sticks, scissors, etc. 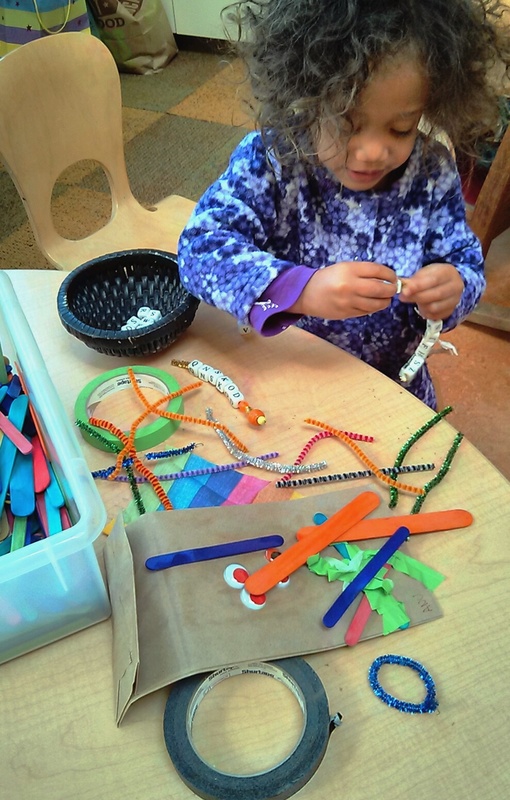 I keep the loose parts in an art cart but, there are many other options for containing materials. Having letters and/or numbers also available as loose parts will offer additional opportunities as their interest in reading and writing grows. 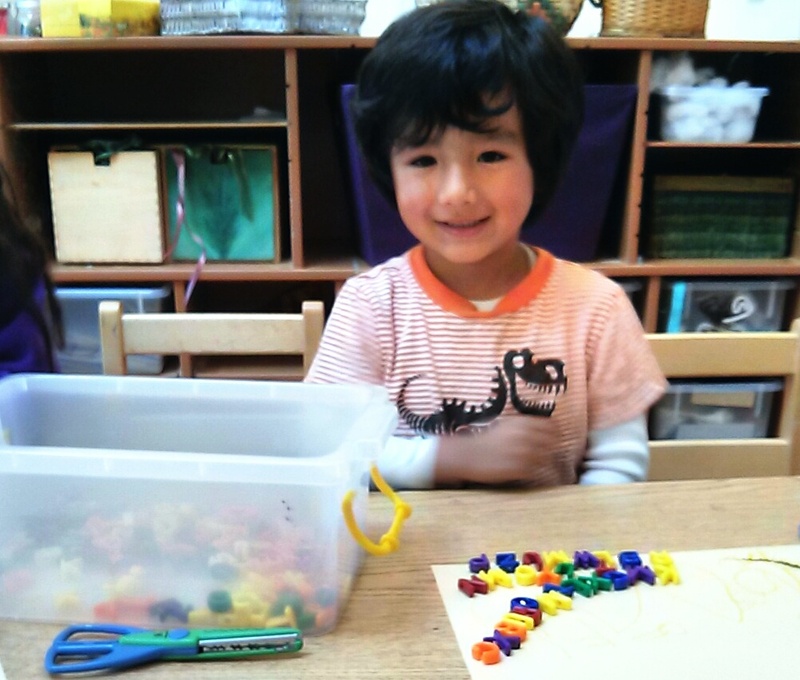 Children who may not appear to be interested in writing, may surprise us by their interest in forming words and names when letters, such as the alphabet beads, are available in your expressive arts center. 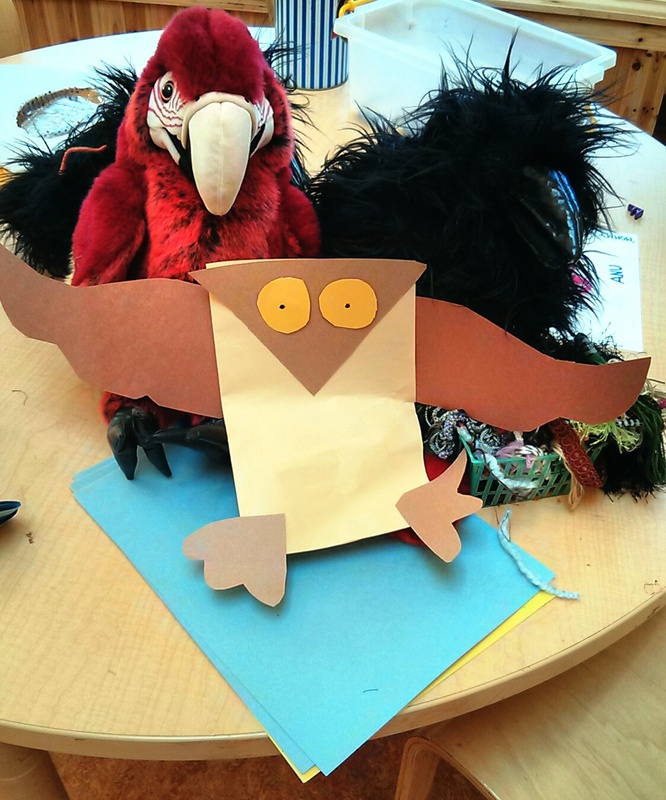 Being able to work with many open ended material, and having them available to use in different ways than traditionally intended, furthers children’s creativity. Their confidence is built by our recognition and appreciation of how they express themselves. Working within small groups, where we can be present as a child’s ideas emerge is another joyful aspect of teaching young children. With the new school year come new classrooms, exciting new work and new rules. The Expressive Arts room also has a new rule this year. Besides “No collecting without connecting” and “No weapons,” we now have a height limit on take-home art. While some teachers have bought art carts to accommodate the flow of bigger and bigger art, even those were beginning to overflow. 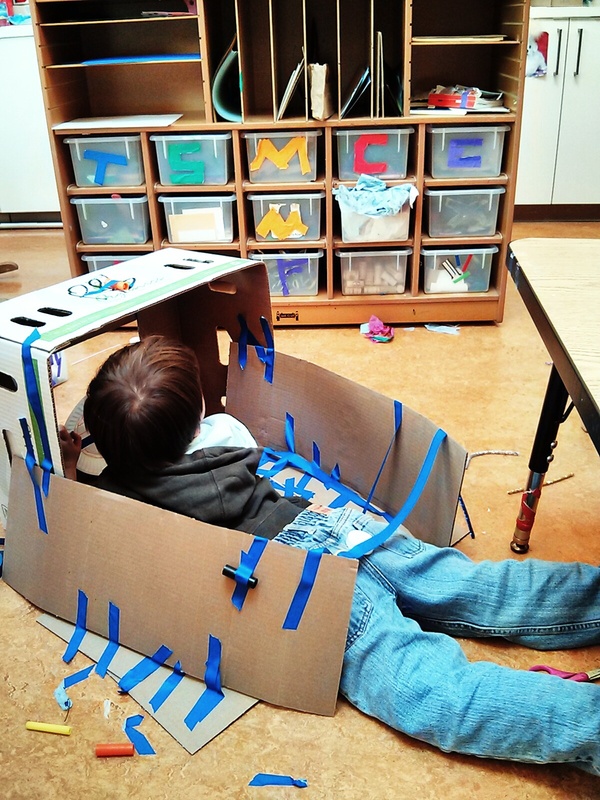 The problem to be solved is how to encourage those children who had a creative urge for BIGGER while accommodating limited storage space in classrooms and homes. 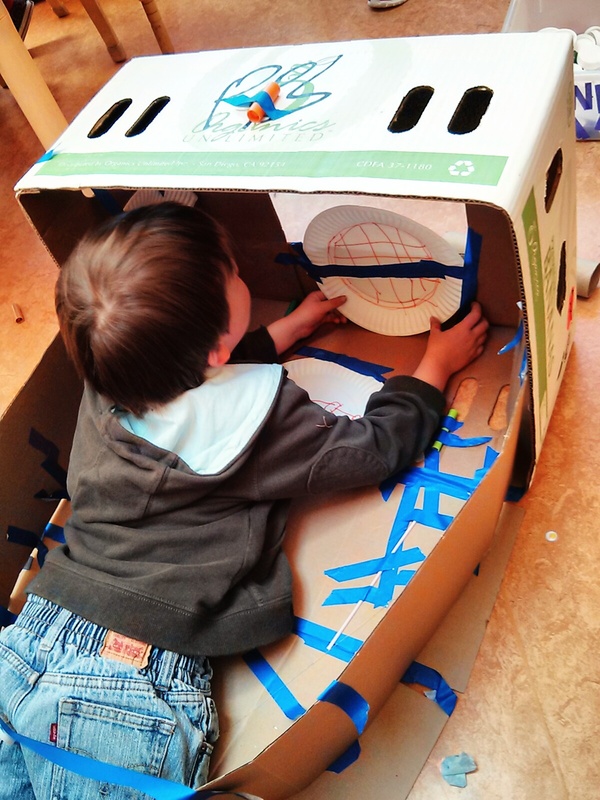 One solution is to have the children measure their own projects. The Orange Arrow Measuring Wall was created for this purpose. Use a horizontal piece of colored masking tape to designate what would fit into the art drawers. 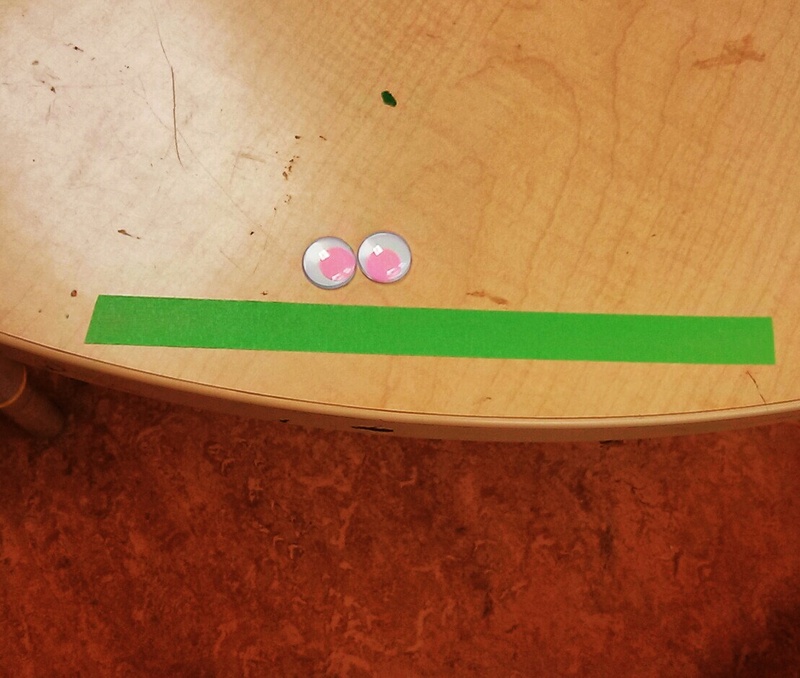 Tape a vertical arrow pointing down to indicate the size that could go back into the classroom and then home. Tape an arrow pointing up from the horizontal line to indicate the art that would need to be hung on the wall until their parents came to pick it up. For art that extends above the orange line, notes are given to the children for their parents. 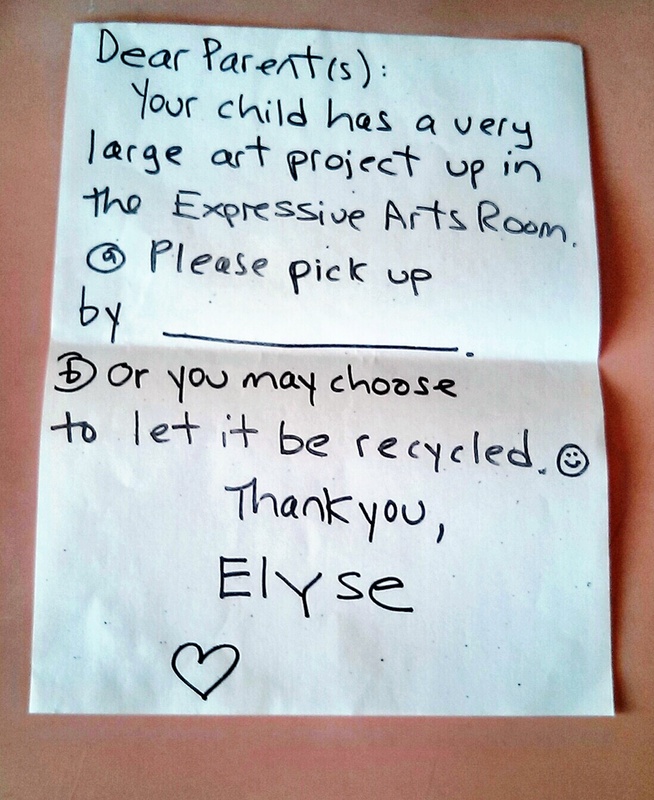 It gives the deadline for either picking up the art or choosing to have it recycled. Space allowing, it could also be left taped to the wall. I introduced the oldest class, our 5 year olds, to The Orange Arrow Measuring Wall and explained how it works. Other than one grumbled, “Oh, no, another rule,” the children seemed accepting. Individually and in groups, they were empowered to monitor size on their own without need for adult intervention. They measured and discerned which art pieces could go directly home and which needed parental permission. 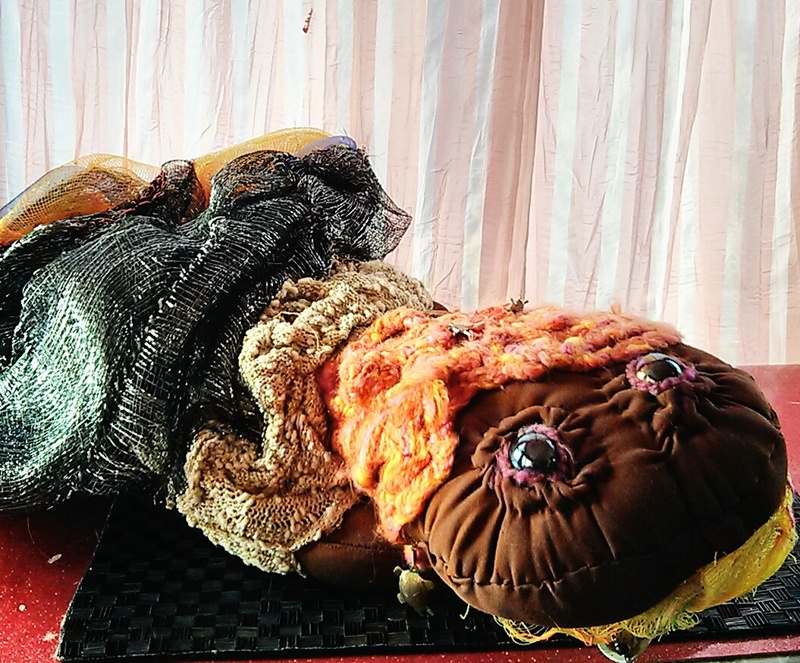 The children were then able to enjoy making their art without size limits while still accommodating the classroom and home needs. They were also able to claim the Expressive Arts room as theirs with the art that they taped to the wall. I continued to observe how this new rule was being received and was delighted when their playfulness soon surfaced. “Look, Elyse, I’m too big to go home,” said one Polar Bear, measuring himself and pointing out how much he extended beyond the horizontal orange line. “We’ll just have to Tape you to the wall and leave a note for your parents to come pick you up here,” I joked. The line-up of those measuring themselves began. Like a favorite story, I said the same comment to each and everyone laughed. 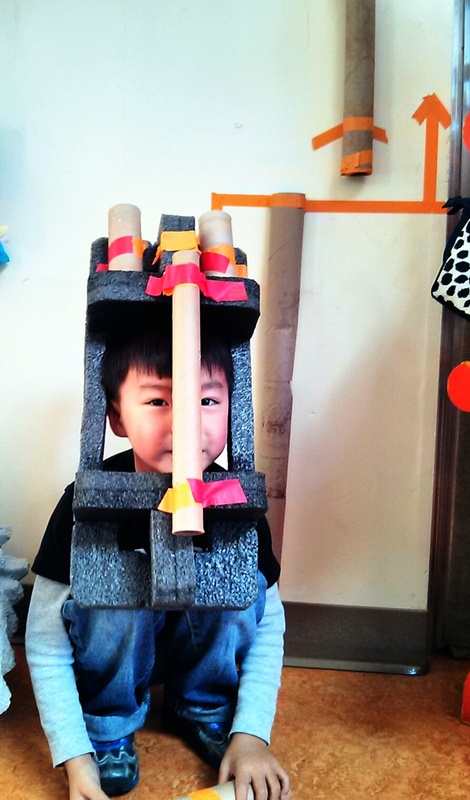 Then one child, wearing his newly made mask, crouched down low enough to stay under the height limit. Again, a line formed with children repeating that they, too, were just the right size to go home. Spontaneously, they all began walking around the room on their knees, laughing uproariously. Some days, new rules and limits can be a whole lot of fun. I have been reviewing manuscripts written for or with my now-adult daughter from when she was a young child. One is called “Tell Don’t Yell.” In total transparency, twenty years ago, I often expressed myself through yelling when I was frustrated. People who know me now are amazed that I was ever less than peaceful. Back then, I was less than peaceful, both inside and out. I had to learn how to find the peace I now teach others. Tears spring forth from that memory, which sparked a journey into becoming a more loving parent, a more compassionate teacher and a better person. 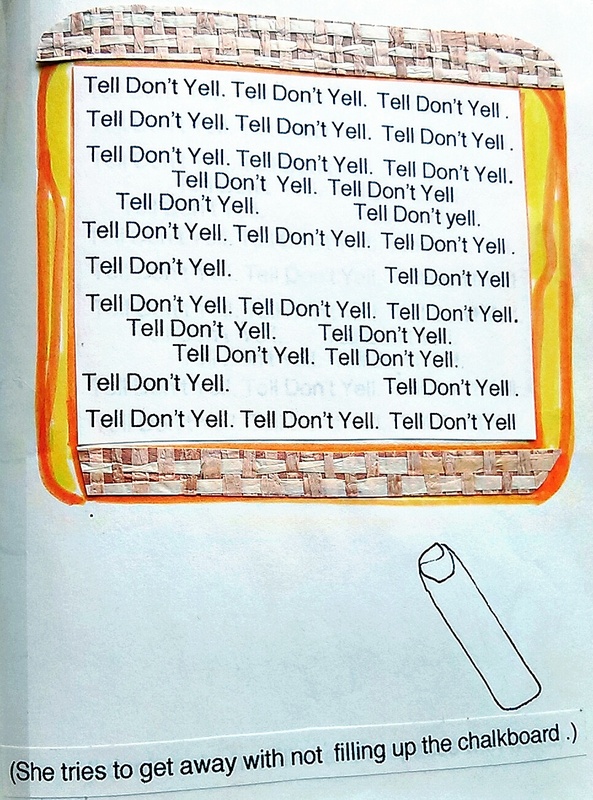 “Tell Don’t Yell” was a one of the manuscripts we wrote together. Our collaboration built a bridge between us that my yelling was knocking down. Effective communication between adults and children is something we all desire. Yet, old patterns and habits can be a roadblock. I can still vividly recall when I attempted to hurry her morning cat-play, so that she’d get to the school bus stop on time. I was sprouting an abundance of words that began to grow louder as my efforts became less effective. 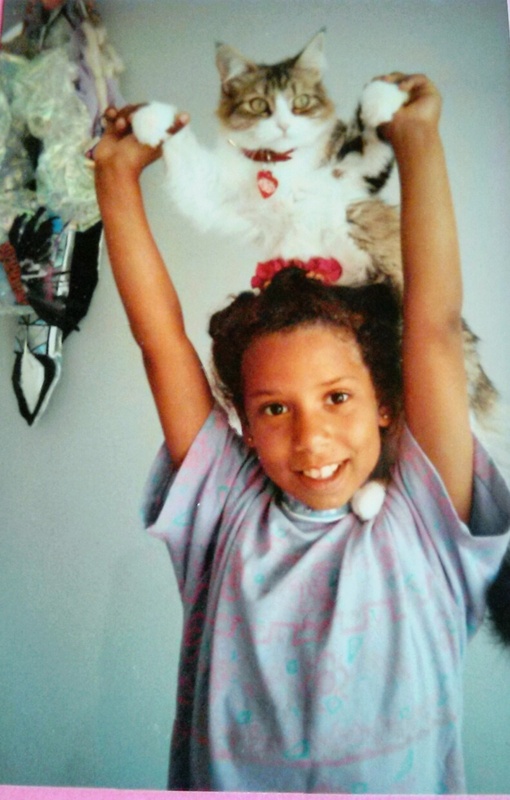 At the exact moment before my amygdala took over and my intellect lost control, my daughter took the cat off her shoulders. My mother yells too much. She yells in the kitchen. She yells in the hall. If her words weren’t blocking the door. With that I laughed, hugged my brilliant co-writer and reached for a pen to capture her exact words. Her words stayed with me until, with consistent motivation and innovation, I learned to tell, not yell. We all thrive on loving connections. If there is a disconnect between ourselves and our children, we are very capable of initiating a reconnection. While we often feel uncomfortable, ashamed or embarrassed at momentarily “losing it,” we need to forgive ourselves for not being the perfect parents or teachers we’d like to be and move forward. One thing I know to be true: we will always be given another opportunity for more generative communication with our children. Writing a story or book together is one form of adult/child collaboration. 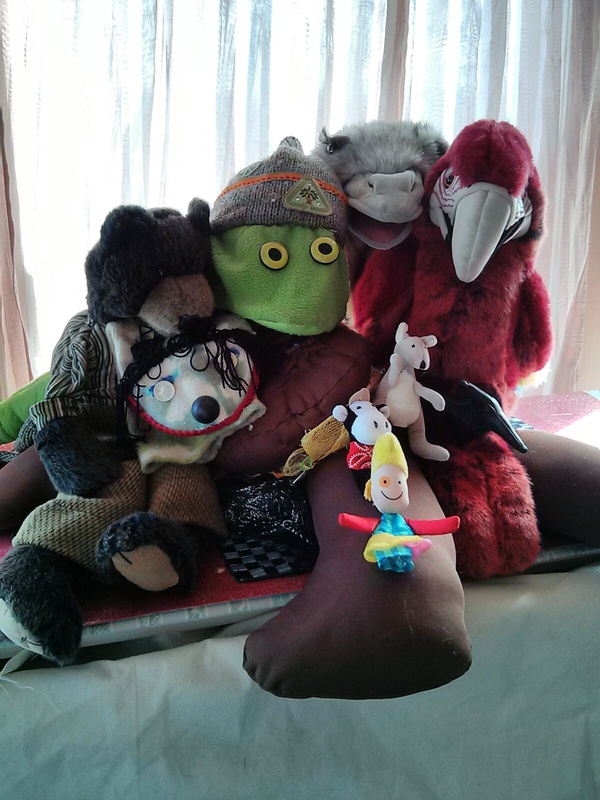 Improvisation or puppet shows can be extremely fun activities for both adults and children. Here is one activity you can add to your collection of tools. Have the child play the part of the parent or teacher; the adult plays the part of the child. 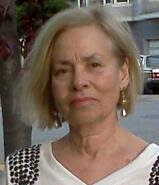 Use a current topic/issue: such as “getting ready for school” for parents; “clean-up time” for teachers. Set the scene: you can have the children determine where it takes place, what has just happened or is about to happen. In expressing yourselves from each other’s point of view, you come to a better understanding. I’ve had a very accurate mirror of my behavior reflected by children who pretend to be Elyse. Humor is so important when initiating change, reducing conflict or finding creative solutions. In our collaborative story, Arianna was my teacher. I had daily homework: practicing telling, not yelling. Loving her as I do, I was a very willing and successful student. In the years following our collaboration, I’ve dusted that retro chalk dust off my hands and learned to be an effective communicator, especially when frustrated. Peace in our homes and classrooms begins with us. 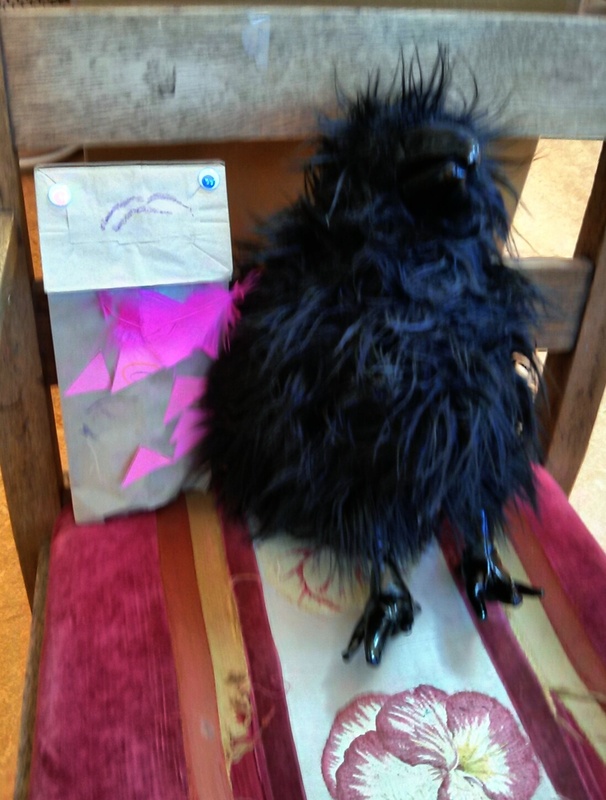 Next Blog: Playing with puppets and children. 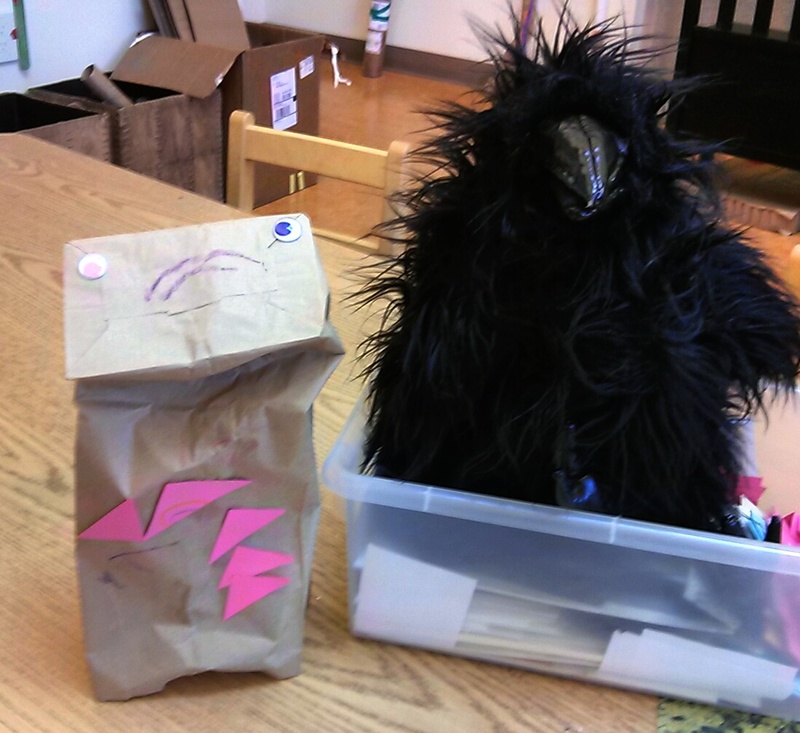 You’ll receive detailed activities I used in teaching an adult class, Puppetry and Its 500 Hats, at a local university.